For some reason this winter season has really flown by for me. I am not sure what it is. Maybe having more projects to work on or that my kids have more school activities or maybe it is something else. But whatever the reason I can’t believe it is already March! Over the last couple of weeks I have been able to go to some great auctions and find some awesome treasures. Sometimes, however, I will buy something simply because it goes for $1.00. 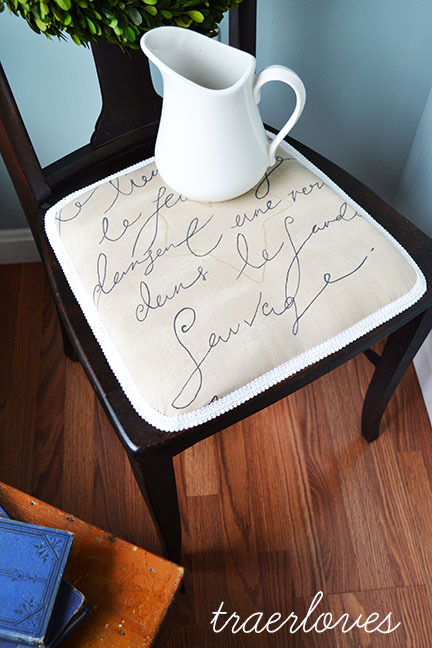 This chair is one of those treasures. I remember the auctioneer asking me to please take it for $1.00! Apparently I have a reputation now! The chair was pretty wobbly and the caned seat was completely broken, but I had hopes I could make something out of it. I used a ton of wood glue in the joints and removed the broken cane seat. I saw this script fabric online when I was ordering the fabric for my bedroom curtains and thought it would look lovely on few chairs I had. I think it turned out very pretty, and it will be heading down to Maryland for the March Barn sale. With Easter only being a few weeks away, this chair reminds me of how we are all made Anew in Christ! We are all broken, discarded, and forgotten, but through His death and resurrection we are renewed and given a new life in Him! I hope you all enjoy these last few weeks leading up to Easter. Hopefully the weather will start to warm up and I can finally get back outside to work on all those projects sitting in my garage! Have a great weekend! P.S. 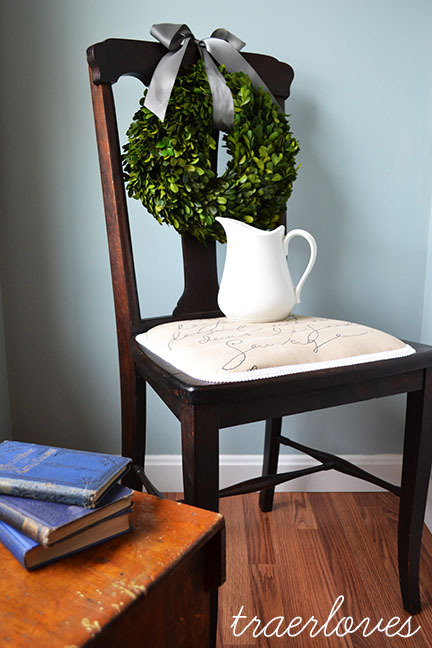 The wreath shown on the picture is a preserved boxwood. I just got a shipment in the mail this last week, and I will be taking some down to sell at the barn this month. I think they help bring a little life around the house this time of year! This entry was tagged decorating. Bookmark the permalink. Thanks Aunt Karen! Love Ya!